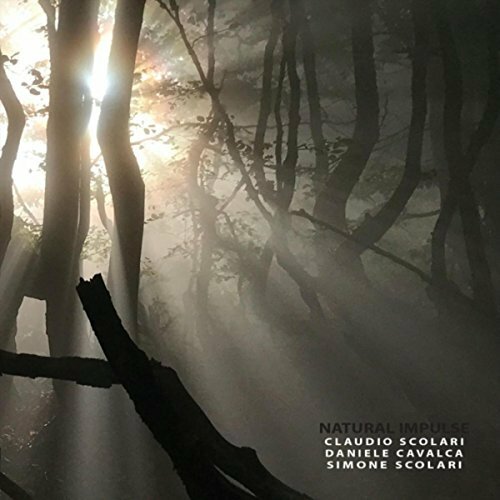 Claudio Scolari: drum set 1, percussion; Daniele Cavalca: live synth, rhodes, piano, vibraphone, bass, drum set 2; Simone Scolari: trumpet. The tunes on this set are credited to all three players, and one gets a strong sense that each piece had a fluid route to its creation. Rather than a clear sense of a composed head-theme-chorus, the tunes have a much stronger feel of the improvised. This is not to suggest that they lack structure or direction; all the tunes have a clear definition and delicate balance of light and shade. Knowing that Claudio Scolari is comfortable in both Contemporary Classical and Avant-Garde Jazz, gives you a sense of what to expect from the set. ​This is music that is not simply propelled from the drum-kit but which brings each instrument into the role of finding and marking the time in the music. There is a sophistication in the rhythmic structure of the pieces that is at the very pinnacle of contemporary jazz playing. Cavalca, the trio’s multi-instrumentalist creates, with the various keys, bass, vibraphone, and electronic effects, a heady brew of jazz-rock-funk (with some sprinkling of Latin). But all of these elements work in the service of the developing rhythmic patterns, and provide a loose harmonic framework over which the trumpet of Simone (Scolari’s son) soars. The trumpet itself has some reverb and echo, to give it a spacey feel that draws out the eerie depths of the pieces – which seem to be nicely captured by the black and white photos that he has taken for the cover art. What was most beguiling was the calmness of the trumpet and the sureness of the melodic lines that were played over the gently swirling backdrop of the other instruments. Each tune has its own personality and all of them have repaid repeated listens. This is a CD that has grown on me and one that I am enjoying immensely.